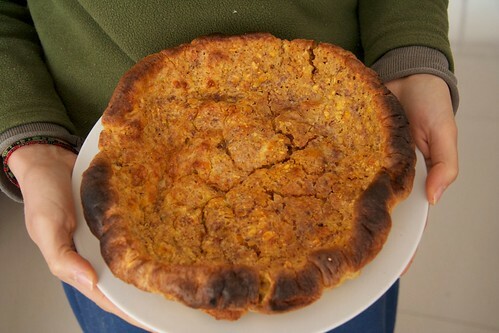 I had never heard of Dutch Pancakes (also called Oven Pancakes) until I searched for pancake recipes using lots of eggs. 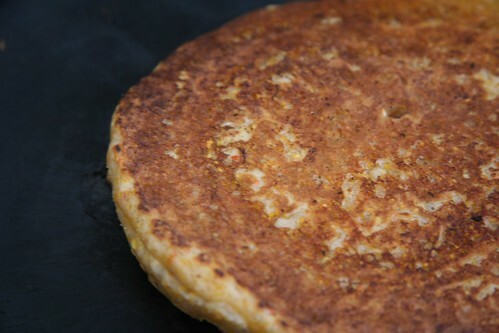 They fluff it up nicely, resulting in a texture similar to french toast. 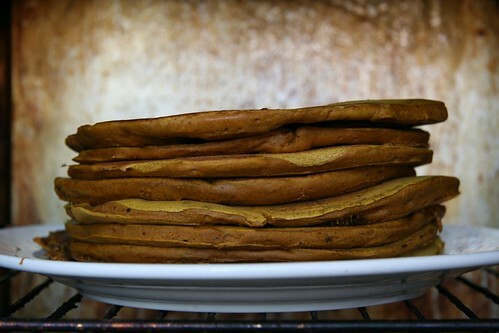 Baba hates eggs but loves this recipe, so it makes its rounds for our weekly pancake breakfasts! 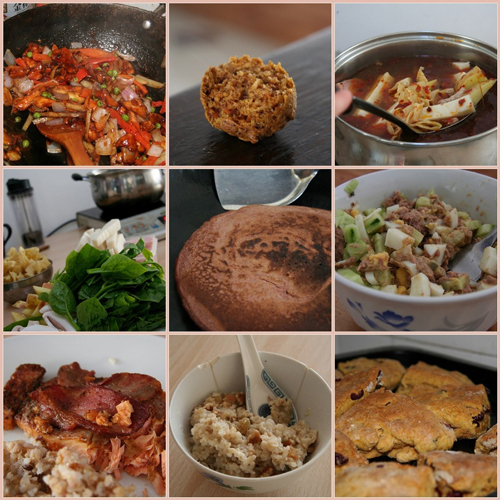 After months of experimenting with buckwheat, I’ve finally developed my perfect buckwheat recipe. I can’t wait til Tigger is old enough to eat it! Click “more” below to read it and try it out for yourself. Ooops! I was revising the Mama Cooks page (sort of our online family recipe box) and realized that I’d never converted the Granola Goodness recipe into U.S. measurements as promised last October! I finally got around to it, so here you go! Oh, wow! 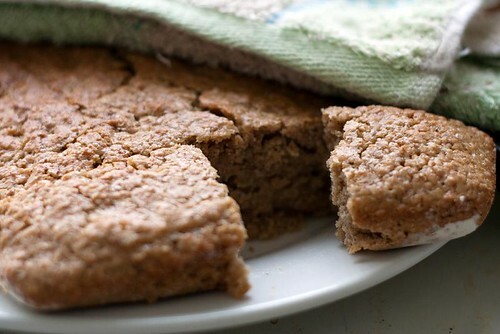 I ran across this photo on my Flickr account this morning and decided Applesauce Spice Bread needs to be on our meal plan for this week! Now, where is that recipe? 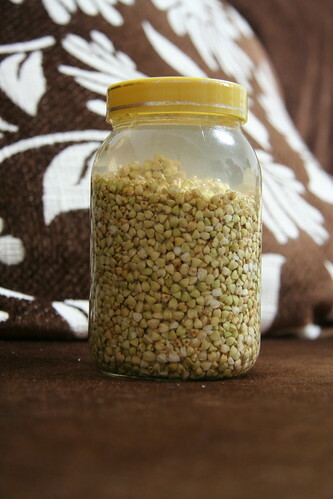 Baba brought home a sack of a new-to-us grain today: buckwheat. 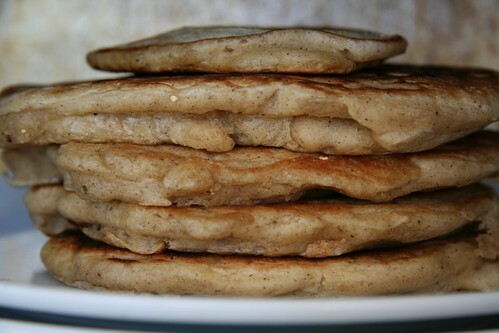 We’re used to buckwheat flour, common around here for delicious buckwheat cakes (dipped in honey, yum! 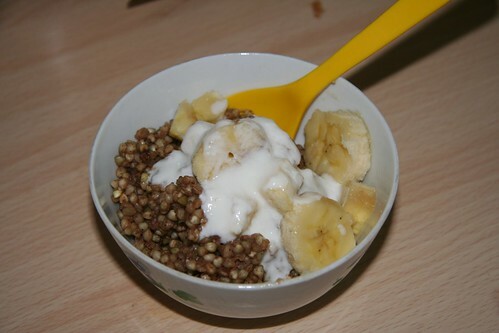 ), but had never tried the grain itself (called buckwheat “groat” when it’s raw). We’ve been experimenting with various whole grains, eating Hasty Pudding (cooked cornmeal) for breakfast and brown rice with lunch and dinner, so we’re going to mix things up with buckwheat. I’ve been feeling more energetic this trimester, and one way I expend that energy is baking. I’ve always enjoyed baking, especially lightly sweet breads for breakfast. I made a lot of applesauce earlier this month so I decided to try out a new recipe this morning. This is definitely my new favorite breakfast bread. 1. Preheat oven to 375°F (200C). Oil and flour a shallow baking pan or glass dish and set aside. 2. Mix together the dry ingredients in a medium mixing bowl. 3. In a smaller bowl, beat eggs, vanilla, oil, applesauce, and milk together one at a time until smooth. 4. Combine with dry ingredients, but don’t over mix! 5. Pour the batter into your prepared dish. Bake in the middle of your oven 25-30 minutes until a toothpick comes out clean. Remove and cool for 10 minutes. Then invert to serve or continue cooling to store. note: MamaWit has moved! Comment on this post at its new location. This isn’t really a pregnancy craving, but I’ve been eating it for breakfast about half the mornings of my pregnancy so far. I generally make a batch every week while it’s warm out, and switch to making a batch of from-scratch “instant oatmeal” on weeks during the colder months. My recipes is adapted to perfection (for my personal tastes, of course) from the “Homemade Granola” recipe on page 116 of the cookbook Artisan Bread in Five. I’ll try to figure out the U.S. measurements soon! 1. Preheat the oven to 200C (375F). Brush a large pan with oil. 2. Mix wet ingredients in a small bowl, measuring out the oil and then the honey (makes the honey slide out of the measuring cup more smoothly). 3. 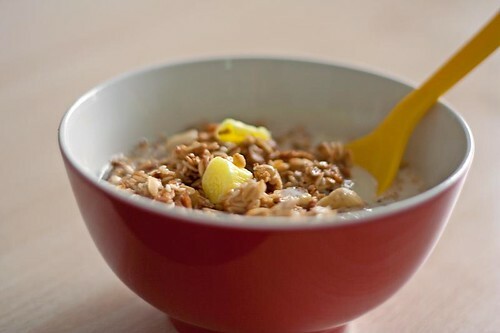 Mix oats, seeds, cinnamon, and salt in a large bowl, then stir in the wet ingredients until everything is coated. 4. 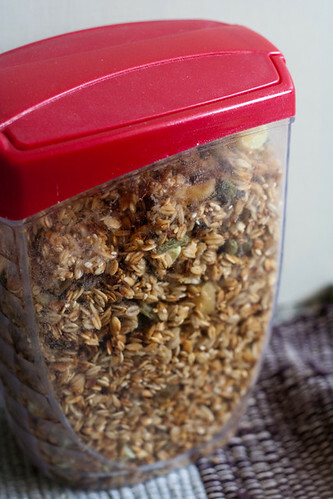 Spread granola evenly on the baking sheet. 5. Bake 40 or so minutes, stirring every 10 minutes until the granola is golden brown. 6. Remove quickly to a large bowl (so it won’t stick) and as it cools, stir in dried fruits. 7. After cooling, store in airtight containers. Serve with yogurt, top desserts, or eat as cereal!